California Week’s Burning Question: Which Player Are You Most Excited To See in 2012-13? The 2012-13 California team will feature a lot of untapped talent, both in newcomers and players who started to break the surface last season, but are primed to have a breakout season next year. While there should be some growing pains early, this team’s potential has Cal fans excited. Which player are you most excited to see (new or returning), and what story will they have written by next April? Connor Pelton: Sophomore-to-be forward David Kravish showed incredible strides last season as a true freshman, so I’m excited to see whether he is ready or not to be one of the top forwards in the conference in 2012-13. The coaching staff did a tremendous job in just the three short weeks they had to get Kravish ready for his freshman season, and he responded immediately by putting up good numbers on the glass. By December, the wiry freshman was also enough of a scoring threat that opposing defenses had to stop focusing on Richard Solomon and Harper Kamp and devote a lot of time in the game-plan to him. Now, Kamp is gone, and the next step in Kravish’s growth as a player will be to increase his buckets on a more consistent basis. That will be tough, as he will no longer be the off-the-radar freshman. But if he can improve his face-up game and bulk up over the summer, there is no doubt that he will be the man in the middle for the Golden Bears when they need a late basket. Andrew Murawa: For the past two seasons, Jorge Gutierrez was a focal point of the Golden Bear backcourt, playing something of a combo guard for Mike Montgomery’s team and acting as a cult of personality on which fans up and down the Pac-12 conference all had an opinion on. With Gutierrez’s graduation, however, the Cal backcourt is firmly in the hands of a couple of juniors: Allen Crabbe and Justin Cobbs. While Crabbe is the one with the brightest future (6’6” shooting guards who can stroke the three at 40% tend to draw the interest of NBA general managers), Cobbs most piques my interest, and he may be the guy who has the biggest impact on the 2012-13 Golden Bears. While it took Cobbs some time to get comfortable in his new Berkeley digs after transferring from Minnesota, by mid-season he was often the best player on the team, carrying the team to a blowout win over UC Santa Barbara in the absence of Gutierrez (25 points on 10-12 shooting), and twice notching double-digit assist games in conference play while consistently playing nearly 40 minutes a night. In his sophomore year he showed a great rapport with Crabbe in the backcourt, able to find his teammate for clean looks, while still maintaining his own dangerous offensive game. While Cobbs may not quite rise to the level of a first team Pac-12 performer next season (at least in any reasonable five-man first team, i.e. not the 28-man first team that the conference regularly puts out), by next April he’ll have the reputation of a guy who is as important to his program as any player in the conference, a guy just as comfortable playing the role of distributing point guard as he is knocking down threes at a high rate, getting to the line on a regular basis and being one of the most efficient guards in the conference. 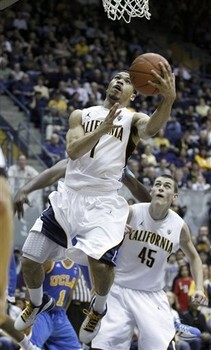 Five different players who earned significant playing time in 2011-12 return for California. Despite losing the Pac-12 Defensive and Player of the Year and their top scorer in the post, the Golden Bears return a solid foundation that should lead them to a second straight NCAA Tournament and fifth consecutive postseason berth. Below we’ll take a look at those five players, in order of last season’s scoring average. Allen Crabbe, Junior, Wing (15.3 PPG, 5.7 RPG) – Out of California’s 34 games in 2011-12, Crabbe played 30+ minutes in 28 of them. The sophomore wing was a workhorse, consistently scoring in double digits (28 times in 34 games) and pulling down five or more rebounds a night (24 times). If you look at his stat sheet throughout the season, you will only find a few games in which Crabbe didn’t have a “good” night, according to his averages. And even in those three games, Cal won all three times by a combined 41 points, so he obviously knew when to take his off nights. Another sign of his consistency is in his numbers from his freshman to sophomore years – they barely change. Crabbe played a third of a minute more in 2011-12, scored 1.8 more points, pulled down 0.4 more rebounds, and 0.1 more assists and blocks. The only statistic that decreased was in the steals category – by 0.4. It’s kind of eerie in a way, but it is also a testament to how consistent Crabbe is. Mike Montgomery and staff have to like the fact that night in and night out, they know they are going to get a solid performance from him. Justin Cobbs, Junior, Point Guard (12.9 PPG, 5.0 APG, 41.3 3FG%) – Cobbs got off to just about as good a start as any transfer player can have. The sophomore point guard averaged 11 points in his first seven games, good enough to take Brandon Smith’s starting spot right out from underneath him. Cobb’s best game came right in the middle of a six-game winning streak for the Golden Bears, when he exploded for 28 points, eight assists, and four steals in a crucial 86-83 victory over Oregon. From a scoring and sharing the ball standpoint, Cobbs did an outstanding job in his sophomore year. As we progress through the summer and into the fall, the next step is for Cobbs to become a more vocal leader on the court. “He’ll have the ball in his hands a lot, so how he responds to Coach Montgomery will have a huge impact on team chemistry. He has a lot of potential, but it’s things like leadership, decision-making, body language, and consistency that are on the wish list,” says “Kodiak” of California Golden Blogs. While California will return four different players from its 2011-12 seven-man rotation, there are three players who saw significant time last year that will be departing. The two players that coach Mike Montgomery will miss the most are seniors, but two promising guards will be transferring out of the program as well due to the logjam at the position. Below, we’ll take a look at the four players who have moved on from the program and how big of an impact their losses will have. 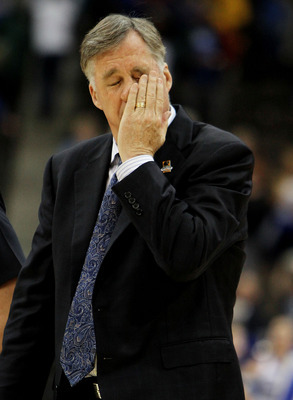 Harper Kamp – The loss of Kamp will do the most damage early on in the 2012-13 season. Throughout stretches of last season’s campaign, Kamp was the only Bear in the low post who could score the ball consistently. Until the Bears are able to find a solid replacement for Kamp, they will struggle balancing out the already guard-heavy offense. Junior forward Richard Solomon will be the best immediate option as he had shown flashes of brilliance before being declared academically ineligible halfway through last season. Highly touted power forward signee Kaileb Rodriguez will also garner a lot of looks early on, where hopefully he’ll be able to hone his game against lesser competition before facing the rigors of a Pac-12 schedule. Kamp will likely go undrafted in the June 28 NBA Draft, but with his style of play, he will certainly end up competing professionally somewhere. Jorge Gutierrez – Anytime you lose the conference’s player of the year, it’s tough. Cal has always been deep at the guard position, but when shots weren’t falling, Gutierrez was the man you could rely on to knock down a clutch jumper. Even if his own shots weren’t going down, he still impacted the game through something else (steals, defense, etc.). If it wasn’t through just plain hustle (i.e., getting every lose ball in his general vicinity, choking defense), it was on the glass or finding the open man. The stats, even if they are ridiculous (13.1 PPG, 5.3 RPG, and 4.1 APG), don’t begin to explain how much the guard will be missed for his hustle and heart. California is coming off back-to-back seasons in which it hasn’t qualified for the Round of 64 in the NCAA Tournament. For a team that is usually always in contention to win the Pac-12, this comes as somewhat of a disappointment to fans in Berkeley. In 2011-12, the Golden Bears looked like they were not only going to make the field of 64, but possibly make it out of the first weekend. Unfortunately, things went drastically wrong for the Bears down the stretch. Sophomore forward Richard Solomon contributed heavily on the glass in the first half of the season, but was lost as an academic casualty midway through January. This didn’t affect Cal immediately, but the strain put on Harper Kamp in the stretch run of the season would cost the Bears, who faced depth issues everywhere. “Over the past few years we’ve lost a lot of depth to transfers (or as an early pro in the case of Max Zhang) – so the players who would’ve been the sixth, seventh, and eighth men (Amandi Omoyke, DJ Seeley, and Zhang) are now playing for Cal State Fullerton or in China,” said “LeonPowe” of California Golden Blogs when RTC talked to him. California would finish its final five games with a record of 1-4, including an embarrassing, not as close as the final score indicated, 65-54 loss against South Florida in the First Four. As people around the program will tell you, however, the floundering finish was a long time in the making. Coach Mike Montgomery seemed to lose trust early in a couple of his players, most notably Brandon Smith. Due to the combination of a poor start by Smith and a hot one by transfer Justin Cobbs, Smith found himself buried on the bench. Even when the team’s top three shooter’s — Allen Crabbe, Jorge Gutierrez, and Cobbs — lost their touch late in the year, Monty decided to ride the sinking ship with them instead of going back into his bench. Smith only saw a combined 13 minutes of action in the final two games of the year, both 11-point losses. He is only one example, though. The already short bench was even shorter by year’s end, as Montgomery settled into a six-man rotation. Against athletic and quick defensive teams like Colorado and USF, the Bears never really had a chance to compete with those teams. Over the course of the next two weeks, the Pac-12 Microsite will break down each team’s season: what went well, what didn’t, and a look ahead at the future. Today’s subject: California. Sophomore forward Richard Solomon was a key contributor when he was playing, but due to being suspended, injured, and then academically ineligible, Solomon only appeared in 13 games. His main contributions were on the glass, where he averaged 5.9 RPG, but he also added a not-too-shabby 5.6 PPG. The Golden Bears only lost two games with Solomon in uniform, and while that could very well be a useless stat, it should also be noted that the Bears dropped a game in each of Solomon’s brief absences early in the year. But besides the losses, his absence put more pressure on Harper Kamp on both sides of the ball, something Kamp did not handle well when facing bigger, talented teams like San Diego State, Arizona, and UNLV. 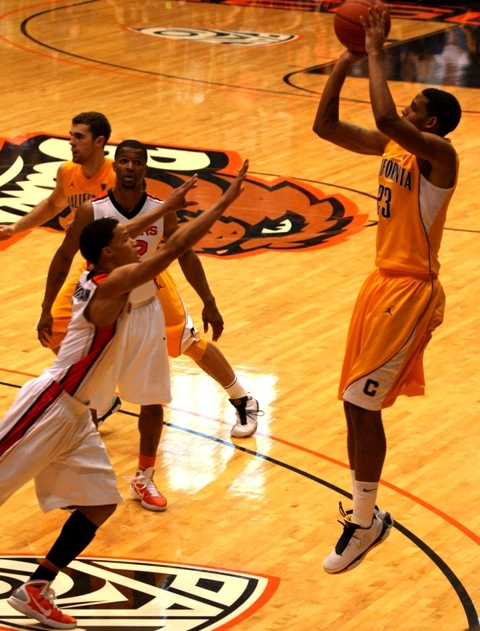 Another big problem was the disappearance of junior guard Brandon Smith. A starter coming into the season, Smith was outperformed by Justin Cobbs in big games, which led to dwindling playing time and dwindling confidence. Smith only had six points and zero assists against Missouri early in the year, and after turning in a zero-point, two-assist performance against San Diego State, he completely fell off the map. Smith was needed the most late in the season as Cal’s shooting woes began, but by then he was buried deep on the bench and only played a combined 13 minutes in each of Cal’s final games, both 11-point losses. All three starters at guard could score consistently, with Cobbs, Jorge Gutierrez, and Allen Crabbe all averaging in double figures. The biggest (good) surprise of the season was the play of freshman forward David Kravish. Kravish immediately made a splash in the low post for the Golden Bears and would finish the season averaging 7.0 PPG and 5.7 RPG. He finished the season with nine games in which he scored in double-figures, but by playing in an already potent offense, his most important contributions would come on the glass. Kravish pulled down a monstrous 18 rebounds in Cal’s 75-49 win against USC to go with two other double-figure rebounding nights. Having your most consistent rebounder being just a freshman has the future looking bright for coach Mike Montgomery’s squad, especially at a position that the Bears haven’t always been very deep at the past few years. Today’s the big day in college basketball recruiting as the spring signing period officially opens. While most of the 2012 recruiting class is already accounted for, there are a couple teams around the conference today who are waiting on some big decisions. The biggest, of course, is the decision from Shabazz Muhammad – the number two prospect in the class – as to whether he will attend UCLA, Kentucky or Duke. However, he’s not the only unsigned recruit who has a Pac-12 school on his mind. Tony Parker, a 6’9” power forward out of Georgia, is also strongly considering UCLA, but he is not expected to make his announcement on Wednesday. Anthony Bennett, the number seven recruit in the country according to ESPNU is still considering Oregon, but he may be weeks away from making a final decision. ESPNU, for their part, listed the predictions from seven of their recruiting experts as to where each of these guys (and all the other elite unsigned recruits) will land, and they have Muhammad and Parker going to UCLA, with Bennett winding up in Florida. Arizona’s recruiting class for 2012 was thought to be done, but they added a junior college transfer – Matt Korcheck – who is expected to sign his commitment this week. Korcheck is a 6’9” forward who is jumping into a crowded frontcourt in Tucson, so he is expected to redshirt next season and retain two years of collegiate eligibility. More importantly for the future of the program, Sean Miller earned a commitment from Duquesne transfer T.J. McConnell. McConnell could well be the point guard that Arizona has been lacking, but he’ll have to sit out next year before becoming eligible in 2013-14. The next big question for the Wildcats will be the future of freshman point guard Josiah Turner, who was suspended indefinitely prior to the Pac-12 tournament. With Turner and junior Jordin Mayes the only point guards on the Arizona roster, the fate of the mercurial lead guard could go a long way towards determining just how much should be expected of the Wildcats next season. Not all of the talk around the conference is of players coming in; at Oregon State, the big news is that junior guard Jared Cunningham will forego his final season of eligibility and enter his name into the NBA Draft. Cunningham was a first-team all-conference selection and averaged nearly 18 points per game, but his decision to remain in the draft is a bit of a head scratcher. Draft Express currently has him being picked towards the back of the second round of the draft, meaning he would not earn a guaranteed contract. He’s got plenty of physical skills, but his inability to consistently hit a jump shot and his gambling style on defense are just two traits that make him a questionable NBA prospect at this point. In Berkeley, Emerson Murray and Alex Rossi will be transferring out of Mike Montgomery’s program, joining graduates Harper Kamp and Jorge Gutierrez on the way out the door. Murray was unable to earn any significant minutes in his first two seasons on campus, so he’ll move north to play for Cameron Dollar at Seattle. Rossi struggled with health problems during his entire California career and leaves having played 16 minutes in two seasons on campus. A landing spot for Rossi is not yet known, and there is speculation that his hernia injury that limited his minutes with the Bears may limit his basketball playing future. Lastly, the Pac-12 All-Academic team was announced last week, and not surprisingly featured two Stanford players on the first team, two on the second team and four more among the honorable mentions. The first team was made up of Sabatino Chen from Colorado, Rhys Murphy from Oregon State, Trent Lockett from Arizona State and John Gage and Jack Trotter from the Cardinal. The team featured all 20 players in the conference who were not only regular players for their teams but also students who earned at least a 3.0 GPA. Arizona, Washington, USC and Utah were the only four schools to not have a player anywhere on the list. I’m not sayin’, I’m just sayin’. With California’s defeat in the First Four on Wednesday night, Colorado is left alone to carry the flag for the Pac-12 conference in the NCAA Tournament. And they made a fine showing on Thursday night, roaring out to a 20-point second half lead over UNLV before letting off the gas, and allowing the Rebels back into the game. But, the Buffaloes were able to cobble things back together, sparked by a great block from Andre Roberson that turned into a Carlon Brown slam on the other end. At the end of the regular season, the Buffs were in a do-or-die scenario, needing to win the Pac-12 Tournament to advance even this far. 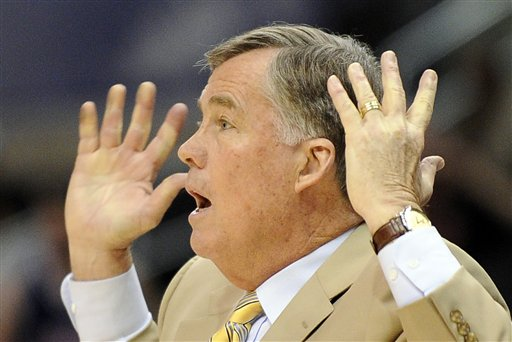 But, it is clear now, as they ride a five-game winning streak that “do” was the choice the team made. In the wake of California’s loss to South Florida, there is a feeling of disappointment around the Golden Bear program. Heading into the final two weeks of the season, they were tied for first in the Pac-12 conference and seemed to be on the road to a special season. Instead, they lost four of their last five, capped by a terrible performance against the Bulls. Now seniors Jorge Gutierrez and Harper Kamp move on, while head coach Mike Montgomery is, apparently, left to rebuild around guards Allen Crabbe and Justin Cobbs. But with every season the 65-year-old head coach wraps up, there is some question as to whether he’s nearing the end. Thus far, there are no indications that he’s planning a retirement party in the immediate future, but, especially after October’s bladder cancer scare, there is the chance that at any time, Montgomery could be ready to move on. One of the defenses of Johnny Dawkins’ poor showing in his time at Stanford is that he inherited a bare cupboard when he took the program over from Trent Johnson. But Jon Wilner sees through that claim and shoots it down, noting that Dawkins’ first roster included two all-conference honorable mention selections from the previous year (Anthony Goods and Mitch Johnson), an all-conference first-team member from two years previous (Lawrence Hill) and junior forward Landry Fields who was about to turn into an NBA-caliber player. Now, of course Dawkins should get some credit for Fields’ development, but the fact is there was enough talent on the Cardinal roster to finish higher than the ninth-place slot they wound up in. Utah’s offseason is off to a pretty good start, as head coach Larry Krystkowiak got his first oral commitment from a 2013 recruit on Thursday, from 6’3” point guard Julian Jacobs. With freshman Kareem Storey having taken over the lead guard role in the wake of Josh Watkins’ dismissal this year, he may have the edge on Jacobs when the newcomer arrives, but as Krystkowiak learned this season, you can never have too many point guards. Arizona State is another program that needs and influx of talent. And while they’ve got some Division I recruits (Bo Barnes and Evan Gordon) that will be eligible next year and freshman point guard Jahii Carson finally able to kick start his career in Tempe, head coach Herb Sendek is spending his NCAA Tournament time hitting the road in search of additional help. Wednesday night was not exactly a banner night in the Pac-12 Conference. Just to tie a bow on a dreadful season, California laid an egg in its opening round NCAA Tournament game, scored just 13 points in the first half against South Florida (which, really, isn’t as much of a crime as allowing USF to score 36 points in the first half – when is the last time USF scored 36 points in any half?) and never really showed up. The Bears only made a run in the final few minutes when the game was already out of reach, causing the final score (65-54) to seem a lot more respectable than it really was. For a team led by seniors Jorge Gutierrez and Harper Kamp, two guys whose careers have been largely based on heart and toughness, to bow out with nary a fight is certainly a disappointing end to their solid Berkeley careers. Arizona’s season also ended Wednesday night as they lost to Bucknell in the first round of the NIT by the same score. This game was far more competitive, however, until the Bison finished the game on a 7-0 run to put away the Wildcats. With a group of impressive freshmen coming in next season, Arizona hopes it will be its last NIT appearance for quite some time. The biggest question for Sean Miller to answer in the offseason, though, is the future of freshman point guard Josiah Turner. Turner is currently suspended indefinitely, and although he did take in the game on the Wildcat bench in sweats, it is possible that he is not long for the program. With Arizona’s promising recruiting class lacking a true point guard, his fate could have a lot to say about what happens in Tucson next year. USC announced on Wednesday that sophomore forward Garrett Jackson will be transferring out of the program at the end of the year. Despite the fact that Jackson started the final 14 games of the season, it has been clear in his two years in Los Angeles that he doesn’t have a bright future playing for head coach Kevin O’Neill. Prior to the rash of injuries that completely sapped the Trojan roster of able bodies, Jackson was just a role player. And with a couple newly eligible senior transfers due in at forward next year, Jackson’s role figured to decline rather than increase in 2012-13. We’ve discussed the possibility that Dana Altman would be considered for the open Nebraska coaching position, but one thing we never considered was that other Pac-12 coaches might be on the Huskers’ radar as well. As it turns out, Nebraska apparently contacted UCLA’s head coach Ben Howland in regards to the job, but found out that they were barking up the wrong tree there. With Altman and Oregon still alive in the NIT and not playing again until Sunday, it could be some time until we find out for sure whether Altman is all-in or folding early with the Ducks. Lastly, Oregon State kept its season alive by blowing out Western Illinois in the first round of the CBI on Wednesday night, earning the Beavers their first 20-win season since 1990. For perspective, Jared Cunningham, who led the Beavs with 22 points, wasn’t even born at that time. The win gives the Pac-12 two teams in the CBI quarterfinals, as Washington State advanced on Tuesday night with a 14-point win over San Francisco. Wyoming will travel to Washington State in the next round, while Oregon State will host TCU, two games that could provide trouble for the Pac-12 teams, considering the conference’s struggles against Mountain West teams this season. Here’s a look at each Pac-12 team’s postseason capsule, by order of each team’s tip-off. Enjoy! First Up: What the Tigers lack in scoring they make up in rebounds and points in the paint. LSU averages 37 RPG and they are led by big men Justin Hamilton and Storm Warren. What makes the Tigers dangerous is their ability to adapt to a certain style. They will play at the pace you want the game at, and then beat you with your own style. Best Case Scenario: With the way Oregon has been playing of late (Pac-12 Tournament notwithstanding), the Ducks can easily make a run in this tournament. With players like Devoe Joseph and Garrett Sim that are able to create and knock down their own shots, Oregon should be able to beat LSU in the first round. After that things get much more tough, but I can’t see the Ducks losing a “best case scenario” game until they would likely meet either Seton Hall or Arizona in the championship. Worst Case Scenario: Even if the Ducks do not play well against the Tigers, home-court advantage should pull them through to the next round. However, they would likely have to travel to Dayton in the second round, and the Flyers pose matchup problems all over the court for Oregon. Expect an Oregon-Dayton matchup to be much like last Thursday’s Colorado-Oregon game. The Flyers stingy defense and potent offense should build a large lead early on against the Ducks, and while Oregon battles to cut the deficit to three with four minutes left, it is never able to come all the way back after a long road trip and an emotinal comeback drians all of its energy. And then there were three. Washington’s nine-point win over Arizona on Saturday afternoon not only kept the Huskies tied atop the conference standings, it all but ended the Wildcats’ chances for the regular season title. Both the Huskies and the ‘Cats have just three regular season games remaining and both Washington and California currently hold a two-game lead over Arizona. Sophomore guard Terrence Ross did the most damage for Lorenzo Romar’s team, having one of the better games of his career, going for 25 points on 11-of-19 shooting and grabbing five steals while layering wave after wave of spectacularly athletic plays on the Wildcats. U-Dub is now done with their home schedule for the year and will need to take care of business against Washington State this week and the Los Angeles schools next week in order to keep at the top of the standings. California wrapped up its home schedule as well on Saturday, sending off seniors Jorge Gutierrez and Harper Kamp in style with a 14-point win over Oregon State. While Washington gets to finish off the year mostly against the bottom portion of the conference, the Golden Bears will have an absolutely huge game next Sunday afternoon when they travel to Boulder to face a Colorado team that has never lost at home in conference play. Cal currently is only up one game in the loss column on the Buffaloes, meaning a CU win next Sunday could go a long way towards getting them back in the conference title picture. As for Colorado, they kept pace with the leaders by grinding out an ugly road win at Utah on Saturday. Former Ute Carlon Brown made his return to Salt Lake City, but failed to have a significant positive impact for his team, hitting just 2-of-12 field goal attempts on his way to only five points for the game. However, Andre Roberson had his teammate’s back, leading his squad in both points (12) and rebounds (16) as the Buffs were able to squeak out a game over a team they beat by 40 points on New Year’s Eve. Colorado will host the Bay Area schools this week before having to make a tough road trip to the Oregon schools in the final week of the regular season. Even if CU is unable to make up the current one-and-a-half game deficit in the conference standings, they hope to finish among the top four teams in the conference in order to earn a first-round bye in the Pac-12 Tournament. Oregon knows all about the race for the ever-important fourth seed in the Pac-12 Tournament. Its grind-it-out win at Stanford on Sunday evening kept the Ducks tied for fourth place with Arizona, with Oregon holding the tiebreaker over Arizona on the strength of their two-point win in Tucson in the middle of January. 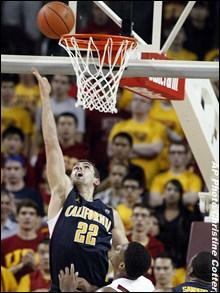 Sunday it was reigning Pac-12 Player of the Week E.J. Singler providing the heroics for Dana Altman, as he scored 10 consecutive points for the Ducks down the stretch, including the go-ahead three-pointer that kept the Ducks from being swept on their Bay Area swing. Elsewhere this weekend, Washington State handed Arizona State a 22-point loss on Saturday after holding the Sun Devils to just eight first-half points. ASU made a bit of a second-half charge to get back within 12 points before a Patrick Simon three-pointer killed that run and sent the Cougars on their way. UCLA, meanwhile, traveled across country to play a 10 AM game on Saturday morning against St. John’s and, predictably, laid an egg. Tyler Lamb turned it over eight times, and D’Angelo Harrison went off for 22 points, eight boards and four assists as UCLA fell to 0-4 against power conference schools outside of the Pac-12.